Thanks be to God for the Lutheran Women’s Missionary League (LWML) — a wonderful partner in mission work with The Lutheran Church—Missouri Synod (LCMS). Our church receives a generous and loving ministry through the LWML, which partners with us in work around the world and in urban communities. 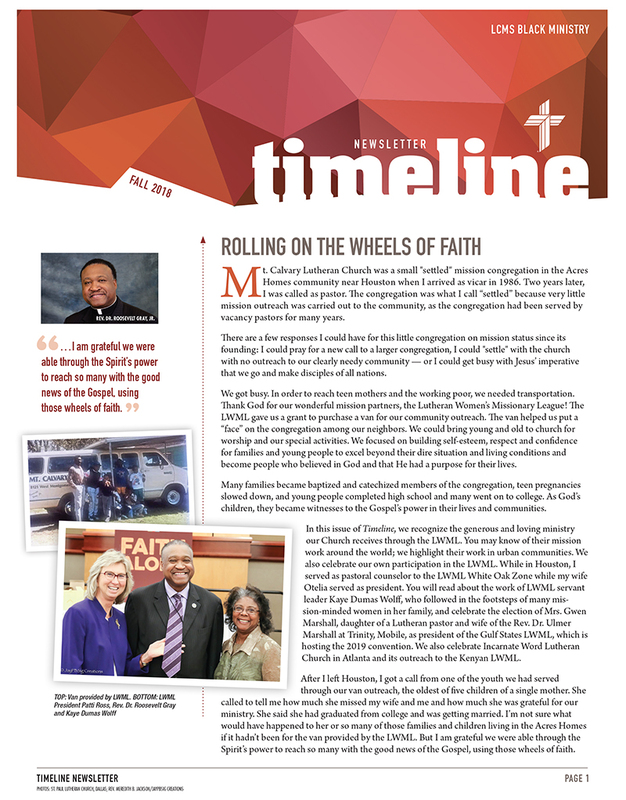 Read the fall TimeLine newsletter to discover stories that illustrate how the LWML makes a difference in the lives of individuals living and serving in our urban communities. LCMS Black Ministry welcomes articles highlighting events, programs, activities, mission and “best practices” to share with other LCMS congregations in TimeLine. Please send your articles to the Rev. Dr. Roosevelt Gray Jr. at roosevelt.gray@lcms.org by Nov. 30 for the next newsletter. Learn more about LCMS Black Ministry. For a free subscription, register for a myLCMS account and choose “TimeLine Newsletter.” If you already have an account, update your newsletter subscriptions in your profile. You may also call the LCMS Church Information Center at 888-843-5267 (888-THE-LCMS) for assistance with registering.